Blackwell Primary School, St Margarets CofE Primary School, Furzefield Primary School, Rusper Primary School, and The Mill Primary Academy graduated from their 10-week Premier League Primary Stars (PLPS) programme at Crawley Town FC recently. PLPS aims to improve wellbeing, boost attainment, to help to increase school attendance and support children and young people in making positive lifestyle choices. Pupils are encouraged to adopt the Premier League (PL) values and link them to their everyday lives in school, on the playground and at home. The values are to be connected, to be ambitious, to be fair and to be inspiring. For 9 weeks, Crawley Town delivers 45 minutes of classroom-based activity followed by another 45 minutes in the form of a PE lesson. The classroom-based session will have a theme, such as health and nutrition, emotional wellbeing, numeracy, literacy, food technology or enterprise. The activity session can be in the form of a multi- skill class, looking at co-ordination and balance, or focusing on football, which can help to give the pupils an extra incentive to learn. As part of the programme, Crawley Town has also incorporated PL Reading Stars, a programme created in partnership with the National Literacy Trust. This session is targeted towards reluctant readers in Years 5 & 6 who would benefit from using football as a tool to engage. 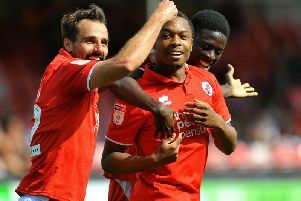 The graduations were hosted at the Crawley Town FC’s Broadfield Stadium, which provided students with a tour of the Stadium itself, a tournament on the 3G Ballcourt, and an award ceremony where children were presented with certificates. Luke Beckess, PLPS Coordinator, said this about the week of graduations, “We had a fantastic week, welcoming five schools to the Crawley Town FC Broadfield Stadium. The Mill Primary Academy even had a special guest attend their graduation. Henry Smith MP for Crawley came along to meet the pupils, and walk with them as they had their Stadium tour. The PLPS programme has been highly regarded in Crawley, and there is a demand from schools wanting to get involved. In a recent study undertaken at the start and end of the 10-week programme, the participants rated their confidence on a scale. 30% felt confident at the start of the programme, but this rose to 88% by the end of week 10. PLPS helped to encourage the participants to express themselves a little more and to be more confident in both learning, communication and in sport. Another question was on whether the participants enjoyed learning. Those who strongly agreed went from 38% at the start of the programme to 65% by the end of it. Crawley Down CofE Primary School, Forge Wood Primary School and Waringlid Primary School have now confirmed their 10-week programmes beginning in the New Year.